If you follow directions easily and respect authority, Enjoying Weight Loss Hypnosis program helps you become slender naturally. You’ve missed one secret ingredient: training your mind to stick to the chosen plan with medical hypnosis instructions – just like the ones in Enjoying Weight Loss program. Could this Be the Permanent Solution You’ve Been Looking For? When practiced by a legitimate provider, traditional medical hypnosis for weight loss is approved for clinical use by both the British Medical Association and the American Medical Association. Don’t be fooled by just any stage hypnotist! Dr. Roberta Temes, the author of this hypnosis program is a world-renowned psychotherapist. She’s the editor of the textbooks used in medical schools today, which means that psychotherapists in training learn how to use hypnosis directly from her. 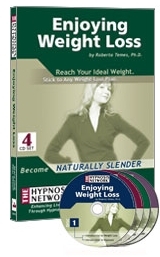 Dr. Temes is the most respected provider of medical hypnosis for weight loss in United States. She’s also on the faculty of SUNY Health Science Center in Brooklyn, NY, and the Department of Psychology at Union County College in New Jersey. You should know all these about her so you can appreciate why she’s the most qualified for helping you reach your weight loss goal. Enjoying Weight Loss Hypnosis 4-CD program takes you through seven short sessions of hypnotherapy scripts for weight loss, each lasting about 20 minutes. You should listen to one session per day – a reasonable time commitment for your slender figure. For best results, listen to the same session repeatedly for a week, then move on to the next, and so on. After the first cycle of hypnosis instructions ends, listen again to the sessions that you liked most. At the end there is an 8th session helping you maintain your optimal weight once you’ve reached it. NOTE: Enjoying Weight Loss hypnosis program is for you if you are pragmatic, logical and methodical, follow directions easily and trust medical authority.